After a long, public legal battle with former producer Lukasz Gottwald—better known as Dr. Luke—Kesha has finally gained the creative autonomy to release an album on her own terms. The resulting project is Rainbow, a record about healing, growing and loving yourself that was on our list of the 15 August albums we’re most excited about. 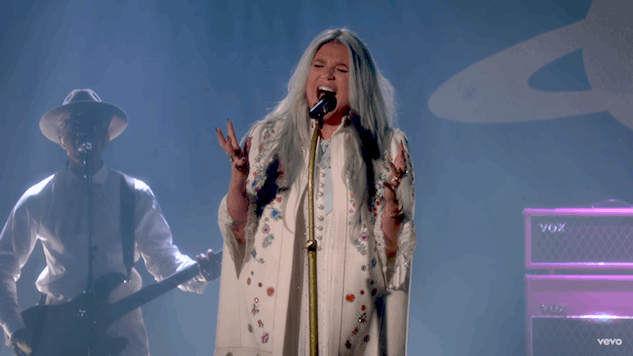 Rainbow was released last night, and to celebrate, Kesha performed “Praying,” a gospel-inspired track, on The Tonight Show Starring Jimmy Fallon and also released a music video for the title track. The Fallon performance is about as powerful as they can get, with Kesha showing off her vocal range in an emotional display of pure talent. The singer appears to have had a weight lifted off of her shoulders, which is both a relief for her fans and a testament to her own resilience. “Rainbow” was the song that started a new chapter in my life. Before then, I had made other people’s opinions of me my higher power. “Rainbow” was the beginning of me turning that around and being kind to myself. It is a reminder that I can make it through anything. I hope this song exudes hope and self-love, because each of us deserves it. Kesha will embark on the Rainbow Tour in September in support of the album. You can watch her perform “Praying” below and check out the “Rainbow” video further down. Stream Rainbow here.